But a new congressional study says Obamacare has, in fact, increased the average family premium by $3,000 – and that's before the most costly requirements of the law take effect next year. The report compiles data from over 30 studies scrutinizing the effect of Obamacare provisions on healthcare premiums. 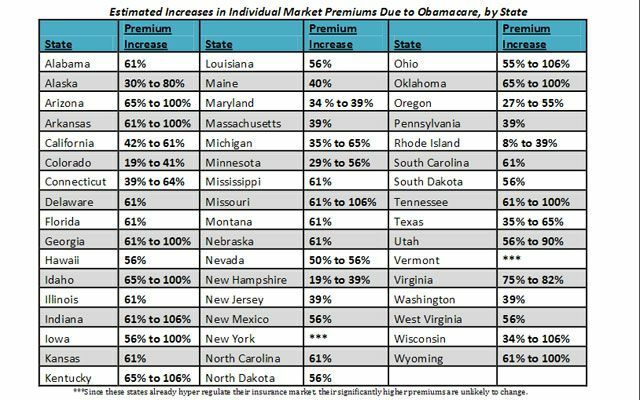 The chart below estimates increases in unsubsidized family healthcare premiums due to Obamacare by state. Source: "The Price of Obamacare's Broken Promises"
We are "Senior Citizens". My husband is 78 y/o, I'm 65. We just went from paying 3900.00 a year for health insurance to a "WHOPPING $10,680.00". Sure didn't see this coming!! Wondered what all the fuss was about. Now I know! Pay attention, folks. Want a breakdown – 99.00 each for medicare premium, 379.00 for a medicare supplement, 46.80 for supplement to medicines, 126.25 for temporary Cobra Dental insurance, 133.99 a month for our adopted granddaughter. This is monthly. Thank God for our pension and Social Security checks. That is more than double. God help us all. What next? Why would anyone believe such a report put out by the violent opponents of the Affordable Care act? This Obamacare is a joke. My family is struggling to make ends me now. Most people I know are in the same boat. He is supposed to be helping the working man not distroying him! You suckers believed Obama's claptrap about Hope. Now pay for it!